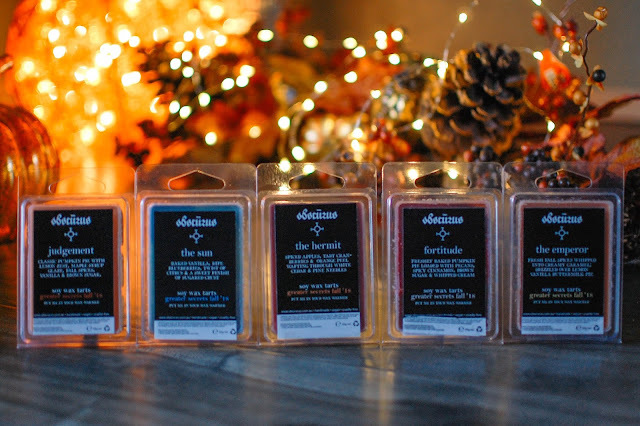 These wax tarts were provided gratis in exchange for photography. All opinions are my own. Femme Fatale's house line, Obscurus, debuted their fall collection which revolves around the Tarot card. These clamshells are $6.50 each in US dollars. 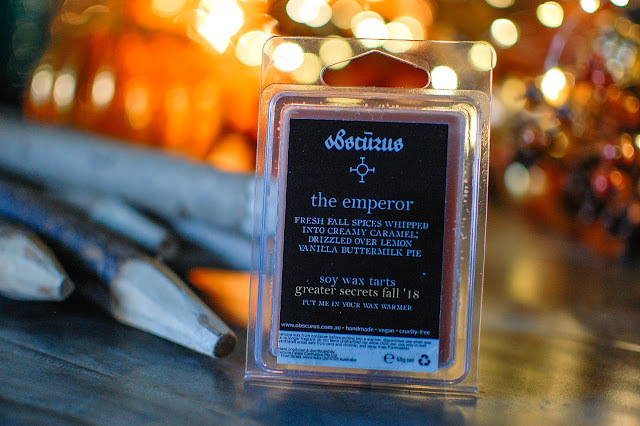 The Emperor- Notes: Fresh fall spices whipped in creamy caramel, drizzled over lemon vanilla buttermilk pie. A traditional pumpkin pie with a sprinkling of warm spices. But the traditional-ness ends there. Lemon curd and a spoonful of sour cream are mixed in the the pumpkin pie to create a whole new dessert experience. Once melted, all the notes meshed into a nice and cozy lightly spiced bakery aroma. Two cubes threw medium in the living area and kitchen. 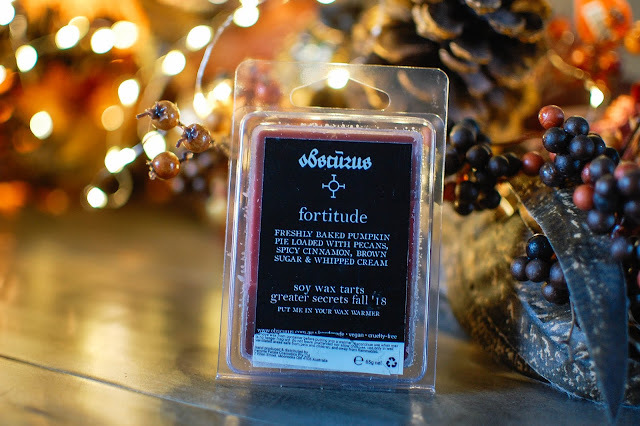 Fortitude- Notes: Freshly baked pumpkin pie loaded with pecans, spicy cinnamon, brown sugar and whipped cream. This version of pumpkin pie is ultra decadent with layers of brown sugar caramel and generous pinches of cinnamon. The pecans are subtle on cold sniff. Two cubes melted strong in the living area and kitchen. This one allowed those pecans to come forth much stronger once melted. 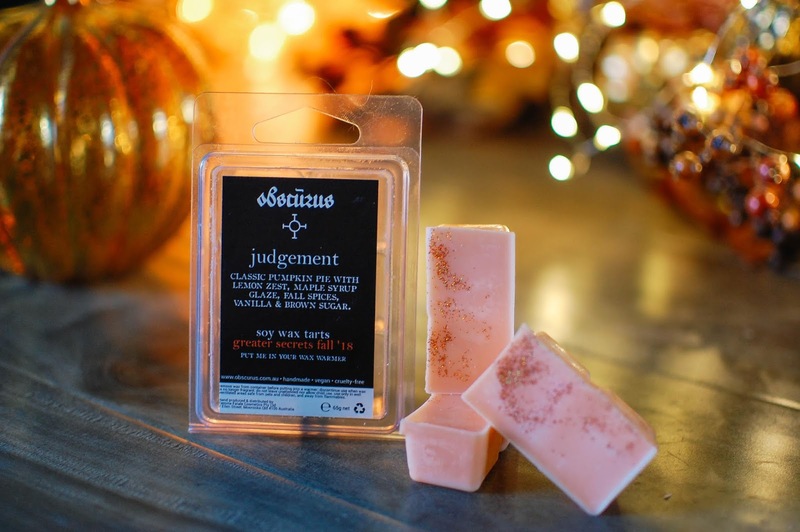 They gave a nutty pie crust vibe to the scent. The Hermit- Notes: Spiced apples, tart cranberries and orange peel wafting through white cedar and pine needles. I really enjoy The Hermit. It is an interesting blending of fall harvest fruits and shimmering pale woods. The apples and cranberries and citrus zest bubble on the stove to make an autumnal fruit compote while silvered birch and evergreens decorate the home. 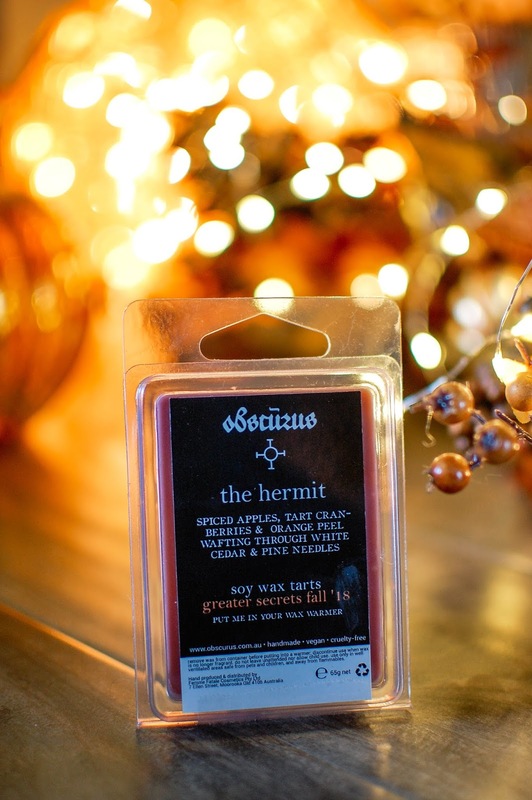 This is a brilliant spin on a holiday scent. Not too spicy and not Christmas tree in any way. 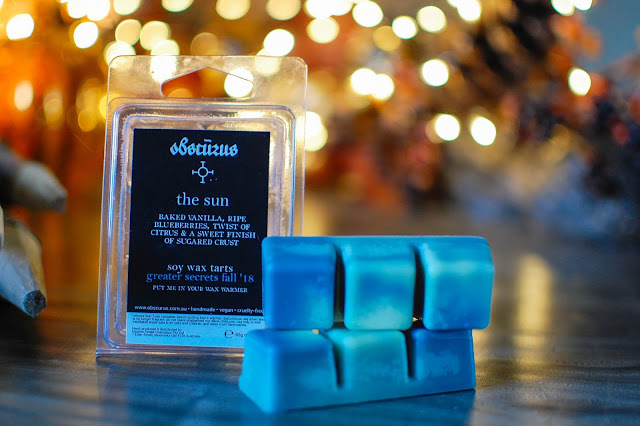 The Sun- Notes: Baked vanilla, ripe blueberries, twist of citrus and a sweet finish of sugared crust. Blueberries and cream layered in a pie shell to make one of my favorite desserts: Blueberry Delight. 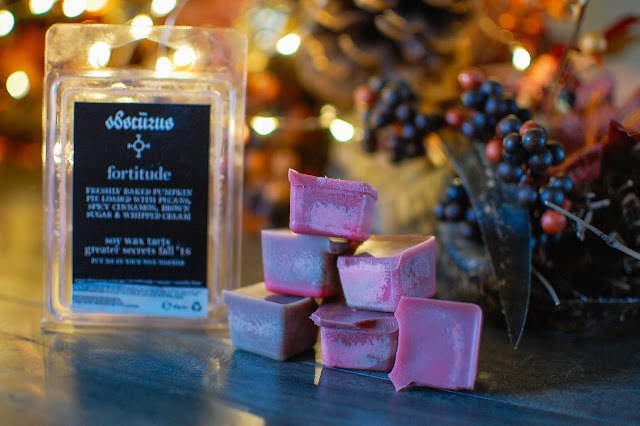 This is an excellent blueberry dessert scent, realistic and sweet and well blended. Though I like it very much I am tucking it away for a friend. 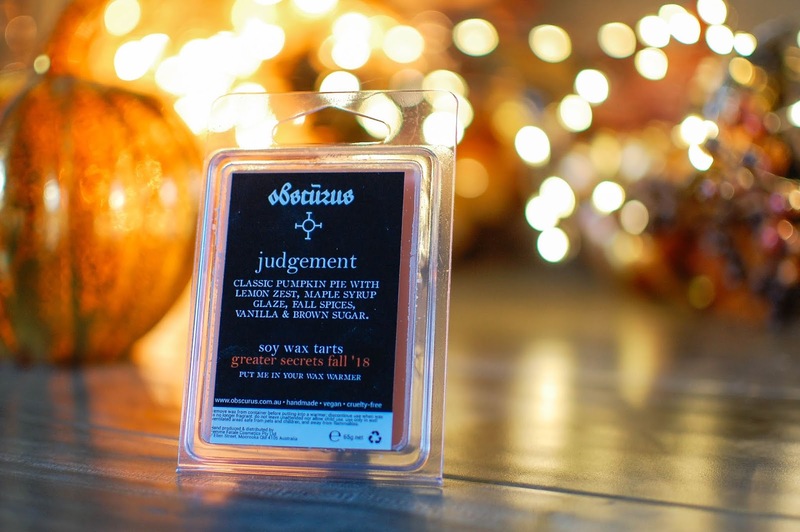 Judgement- Notes: Classic pumpkin pie with lemon zest, maple syrup glaze, fall spices, vanilla and brown sugar. Judgement is more lemony than The Emperor to my nose, the dairy factor is not present either. I pick up more ginger in this version of pumpkin pie too. The maple is light but adds a nice sweetness. It is an interesting blend and a nice take on a lemony gingered pumpkin pie. I have not gone all pumpkin spice crazy as far as everyday foods but I do have some around the house. I picked up some Cascadian Farms Pumpkin Spice granola bars and Pumpkin Spice Simply Natural coffee creamer. I am also enjoying putting some extra pinches of cardamom and cinnamon in my morning coffee. I do have several spiced pumpkin fragrances from both Nocturne Alchemy and Arcana Wildcraft. Nocturne Alchemy's Pumpkin Library collection (one sale now here) is a great place to start if you want to dip your toes into that kinda thing. Do you have any favorite pumpkin spice treats? 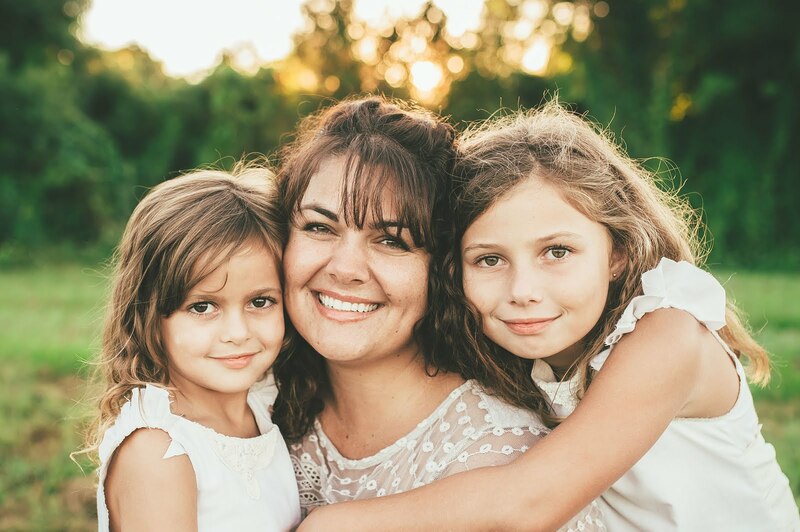 Fall Fun Fridays and Three Ravens Co.